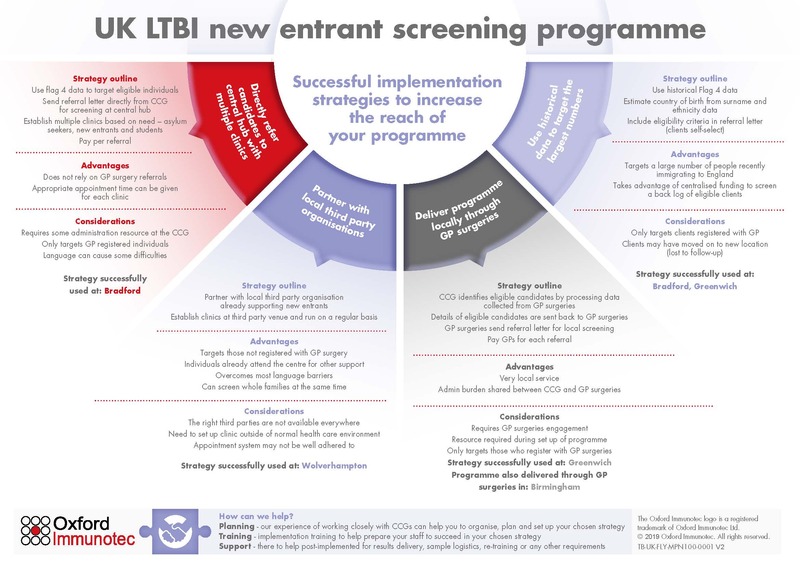 New entrant latent tuberculosis infection screening in the UK. Oxford Immunotec were selected by NHS England and Public Health England to provide tuberculosis (TB) testing for persons recently immigrating to England as part of their strategy for TB control. Despite the commitment of those delivering and organising TB services, the TB rates in England have remained high (amongst the highest in Western Europe). This strategy represents a significant initiative in the fight to ultimately eliminate TB as a public health problem in England. Winning bidders in each region were selected on the basis of service capability, quality and price. Oxford Immunotec will provide T-SPOT®.TB testing services from its Oxford Diagnostic Laboratories (ODL®) in the United Kingdom. ODL will provide educational, administrative and logistical support to the local implementation teams. For further information please contact 01235 442780 or email uksales@oxfordimmunotec.com. If you require more information on the NHS programme please visit NHS England FAQ Page.